I learned about foundlings – abandoned newborns – in Italy while tracing my own immigrant ancestor back to the province of Palermo in Sicily. My maiden name is Palumbo, but as I tried to move backwards from my immigrant ancestor, Salvatore Fortunato Palumbo, I discovered that Palumbo was not his original surname. Explaining this discovery in detail is beyond the scope of this blog post, but I have documented evidence that my paternal great-great-grandfather's name was Salvatore Fortunato Esposito inteso Palumbo. I had no idea where the "Esposito inteso" portion of my surname originated until I located Salvatore's death certificate, which stated his parents were listed as "parenti ignoti" or "unknown parents". Then the pieces began to come together. As I continued to investigate further, I learned that the surname "Esposito" was a common surname given to foundlings. It appears that the Palumbo family may have fostered my great-great-grandfather (or perhaps he apprenticed with them), and that is how he obtained the Palumbo surname. As I've researched in Italian records, it is not uncommon to come across abandoned children in Italian civil records. In some cases, children were abandoned because their parents were too poor to care for them, but the majority of abandoned children were the result of illegitimate births. Social and political policies made it difficult for a pregnant, unmarried woman to keep and raise an illegitimate child. Not only did this situation bring shame to her, but also to her family, even to the point of making it difficult for her or her siblings to find suitable marriages. Foundling wheel at the "Ospedale Santo Spirito" in Rome. Courtesy of Wikipedia.com. One way to "deal" with these unwanted babies was to leave them on the side of the road, in a remote area, or throw them into the sea. In the 16th and 17th centuries, infanticide was reaching an all-time high and the Catholic church's concern for the souls of these babies played a large role in the development of foundling homes, which offered another option to unwed mothers. This was not only a phenomenon in Italy but other Catholic countries such as France, Spain, Portugal, Belgium, Ireland, and Austria. 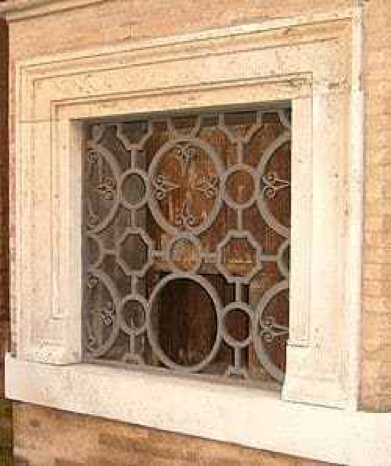 In order to allow the anonymity of the mother, and thus keep her and her family from being disgraced, the ruota dei proietti or "foundling wheel" was instituted. The foundling wheel was a wooden, cylindrical box that was installed in the outer wall of a hospital, church, or in smaller communities, a midwife's home, into which a newborn could be placed. The wheel was then turned, so that the baby went inside, without anyone being able to see (from the inside) who placed the baby on the wheel. The person leaving the baby then pulled a bell that was near the wheel, notifying the attendant inside that a foundling had arrived. These attendants, usually midwives, served as "keepers of the wheel," and had the responsibility of taking the baby to the town hall to have the birth registered, and then to the parish church for its baptism. They also had the responsibility of finding a wet-nurse to feed the baby. As these wet-nurses were given a small compensation for their services, in some instances the mother of the baby would seek to become the baby's wet-nurse herself, and have the opportunity of bonding with her baby, even if it was anonymously. Esposito/Esposto = "exposed" or "abandoned"
Proietto/a = a designation meaning "thrown away," "cast-off"
Names that indicated a physical characteristic, such as Bruno = "dark-skinned, dark haired"
Many of these surnames exist to this day, with their bearers having no idea that somewhere in their ancestry there was a foundling child. Where to locate records of foundlings depends on the town and time period. Some towns recorded the births within the regular birth registers. Other towns separated abandoned baby births from legitimate births and recorded them in supplemental birth registers, or allegati. Because it was standard practice to record the physical description or appearance of the abandoned baby (the approximate age, if it was clean or dirty, what clothing or wrappings it had) and any tokens or segno di reconoscimento that were left with it (jewelry, a torn picture of the Madonna), these births were sometimes recorded in a Parte II after the regular birth register. This allowed more room to discuss the specifics of the child's abandonment than the pre-printed forms. The reason the specifics of the abandonment were so carefully recorded is because if the mother was able to reclaim her baby in the future, she could identify them by these items. If she left a torn picture, for example, she could match the torn piece to prove her connection to the child. Often, the child was not born in the town they grew up in or lived in as adults. Those children who survived might have been sent to the country to be raised by wet-nurses in rural areas. They may have been fostered by local families since the towns paid a stipend for the child's care. These payments were usually made until age 14 for boys when they were apprenticed to learn a trade, and 16 for girls with a small dowry so they could marry. These situations were usually informal and often did not leave paperwork. The parents of my 2nd great-grandfather remain a mystery to me, but the discovery of his true surname of Esposito has given me an insight to his humble beginnings as a foundling on the island of Sicily. He beat the odds and survived, to which I owe my own existence. Kim Running is a Project Manager at Legacy Tree Genealogists, a worldwide genealogy research firm with extensive expertise in breaking through genealogy brick walls. If you have Italian ancestry, a brick wall ancestor you need help getting past, or just questions about the details of your ancestors' lives, our experts can help. Contact us to talk about which project would be best for your needs, or visit our website at https://www.legacytree.com. Special Offer for FindMyPast users: Receive $100 off 20-Hour+ research projects with code SAVE100.